In fall 2015, Travel Beyond consultants Kayla Torgerson and Katie Blackstone traveled to Vietnam, Cambodia and Myanmar. The trip was Katie’s first experience in Asia and Kayla’s first time back in Asia since living in India. Below is Kayla’s account of their time in Cambodia. After our week in Vietnam, we explored Cambodia—a destination that’s an easy add-on to almost any trip in Southeast Asia. Many travelers only visit Siem Reap for 3-4 nights while in Cambodia with the sole purpose of seeing Angkor Wat, but others travel to Phnom Penh or venture off the beaten path to Cambodia’s jungle and beach destinations as well. In Siem Reap, we stayed at the Borei Angkor Resort & Spa, a grand hotel that still manages to exude a warm, homey feel. We were instantly wow-ed by beautiful, massive gold lotus flowers in the reception area, and we found the staff to be exceptional. The hotel also had a great pool area and spa for some R&R during a long adventurous trip, and the location was ideal – a 5-minute tuk tuk ride from the main area of town, Pub Street. We couldn’t believe the ride was only $1 per person! Katie and I also visited three other hotels in Siem Reap: Shinta Mani Club, Shinta Mani Resort and the Raffles Grand Hotel. The two Shinta Mani Hotels were awesome, and if you stay at one of these properties, you have access to both! Both properties have an artsy vibe and are within walking distance of Pub Street, but in a quiet area. The Shinta Mani Club had a boutique feel, with a small swimming pool that was surrounded by the hotel itself. The restaurant at the club has a fine dining tasting menu, which was delicious, as well as an a la carte menu. The club is ideal for couples, whereas the resort is better for families–offering a larger pool space and a more casual restaurant. On the other hand, Raffles Grand Hotel is a Victorian-style historic hotel built in the 1930s, the first hotel in Siem Reap. The hotel features an art gallery, shops, a bar, restaurants, high tea and an ATM within the property. The large property also features a nice pool, surrounded by the hotel on 3 sides and two separate huge villas that reminded us of some of properties we’ve visited in Africa. Our first full day of touring in Siem Reap started with a visit to Angkor Thom. It was very busy and raining a little bit, but our guide made it a really great experience. He gave us umbrellas, told us personal stories about his life, and still took his time showing us around the massive complex despite the rain. The rain actually made my photos from that day quite mysterious and eerie – I loved it! Angkor Thom has many towers and many faces – it’s stunning! I had never seen such intricate carvings on such massive, larger-than-life structures. Their craftsmanship is impressive to say the least! (Ponchos were also available for purchase everywhere, but we were comfortable with just the umbrellas). We were then driven to Ta Prohm, the jungle temple where Tomb Raider was filmed. The trees are growing over the temples, so you really get the sense of the age and mystique of these temples. The whole complex makes you feel quite small when the trees growing out of it are more than 10-15 feet wide at the base. Later that afternoon, we visited the world-famous Angkor Wat and explored the complex until sunset! There was so much to see and learn about. In the middle of the complex there are some steep stairs you could climb to a viewing point the central tower. It was about a 20-minute wait to access the top viewpoint, but well worth it! The views are unreal and from that vantage point you gain perspective on the massive scale of the entire empire. When entering scared temples in Asia, you often need to remove your shoes and wear conservative clothing out of respect and tradition. Luckily, you only need to have shoulders/knees covered when going up to the top level for the views. You don’t need to wear anything conservative throughout the rest of the Angkor Wat complex (which can be a big relief when it’s hot!). Siem Reap itself is a fun town! There is a lot of great shopping on/around Pub Street as well as many great, inexpensive restaurants. We went to a Cambodian BBQ where they gave us about 7 different meats (chicken, pork, beef, shark, crocodile, etc.) and then we cooked it ourselves on a little BBQ pit at our table. The meal came with unlimited soup, rice and veggies. It was a delicious and fun meal! Another favorite food of ours in Cambodia was the pineapple fried rice – yum! After Siem Reap we continued to Phnom Penh. The main reason to visit Phnom Penh is to learn about Cambodia’s horrific genocide history. It’s really a difficult reason to travel to a place, because the history is so hard to stomach, but I’m so grateful we didn’t miss this important part of Cambodia’s history. I feel that I understand Cambodia so much better after visiting, and I am so impressed with the resilience of the Cambodian people! We began our day with a visit to the Royal Palace and the Silver Pagoda (next door to each other). The palace is beautiful with perfectly manicured gardens and brightly colored gold roofs. When you get closer each building in the complex is ornately designed and decorated. This palace serves as the King’s residence still today, although the buildings where he resides are not open to the public. As we admired the beauty of both the palace and the Silver Pagoda, our guide expanded upon their interesting history and the various kings who resided here. The Silver Pagoda has beautiful paintings that surround it, which were being restored during our visit. I’m eager to see the results once the restoration is complete! Before lunch, we visited the Russian Market, apparently named because of the number of expats who historically shopped here, not because of the market goods. This market has everything – local food, handicrafts, etc. We enjoyed shopping here, and our guide let us explore at leisure before we continued our tour. After lunch, we visited the Genocide Museum, a very interesting and worthwhile experience. Our guide Dararith, who went by “Red,” lived through the Khmer Rouge and told us personal and dynamic stories about his family’s experience and separation. He was lucky enough to have almost everyone in his family survive and be reunited years later, and his story especially very moving given our surroundings. The Museum itself is an old school that the Khmer Rouge turned into a prison when they took over the city in the mid-to-late 1970s. Throughout their rule, about 10,000 prisoners came through this tiny prison to be interrogated and tortured (for scale, this school was about a third of the size of the average middle school in the U.S., if not smaller; it was very small for that number of people to pass through). In addition to viewing photos of the prisoners and soldiers (often extremely gruesome and difficult to view), we were also able to walk into the cells, where they endured horrific conditions. At the end of the museum, there were story boards that told the tales of 7 of the survivors – a small light at the end of a very dark tunnel. After touring the museum, we drove to one of the many killing fields, about 45 minutes outside of town. The killing fields were places that the Khmer Rouge regime took many Cambodians who were suspected of having connections with the former government to be slain. Scholars, people of foreign ethnicities, and anyone else who Pol Pot considered to be a threat were also taken to these mass graves for execution. Estimates on the death toll vary, but most experts agree that somewhere between 2-3 million people were murdered and buried during Cambodia’s relatively recent genocide. In the middle of the field, there is a monument that contains countless skulls and bones from the people killed there, surrounded by many small memorials for the victims. When we were just walking through the fields, there were pieces of bones in the walking path which had become uncovered after rains. The official excavation had already been finished at this site because there was so much evidence already compiled against the Khmer Rouge, but there are many remains that will never be recovered. This tour is not for the faint of heart, but Katie and I found it to be an incredibly powerful and important experience. 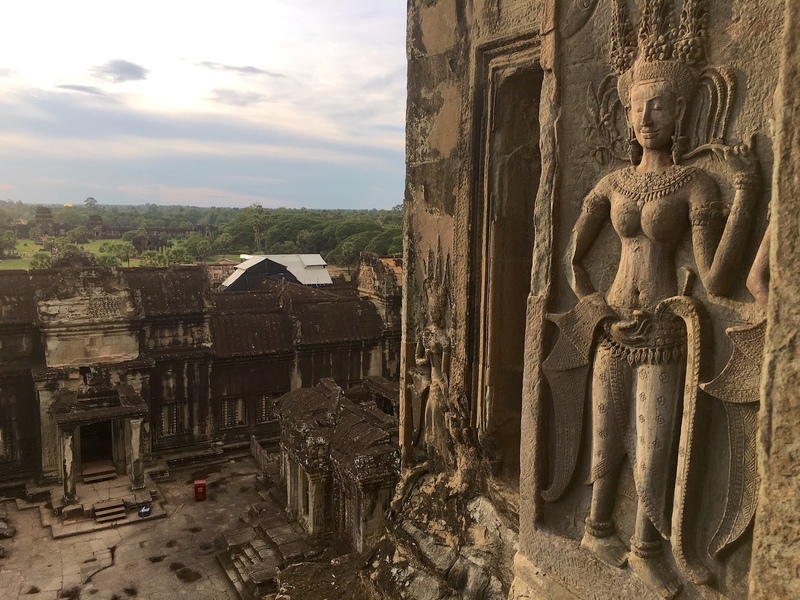 To say Cambodia’s history is tragic is an understatement, but we were so grateful to hear our guide’s stories firsthand and to see both the good and the bad of the country’s history as well as experience the wonderful and peaceful country it is today! Cambodia will always have a special place in my heart, and I certainly intend to go back to explore it more in the future! Cambodia has so much more to offer than just Angkor Wat–incredible stories, a beautiful countryside, fantastic jungle and beach destinations, and last, but not least, amazing food! After Phnom Penh we continued our 3-week adventure in Myanmar!